NORTH AMERICAN ING ROUND 1 CROSSTABS/GAMES: Click here for complete first-round results – including 10 game records — from the North American Ing Masters tournament. 13X13 TABLE WINNERS: Henry Zhang 2k, Yukino Takehara 4k, Sathya Anand 7k, Charles Polkiewicz 14k, Oliver Wolf 2d, Mark Gilston 1d and Kory Stevens 5d. Takehara, Anand, Gilston and Stevens are all in the finals. 14 dan players total; 24 kyu players total. 9X9 TOURNAMENT: Dan division: Matthew Burall 7d plays Josh Larson 3d; Kyu division: Scott Abrams 2k plays Albert Hu 3k; Smith Garrett 12k defeated Sathya Anand 7k and will play the winner of the Abrams-Hu game. 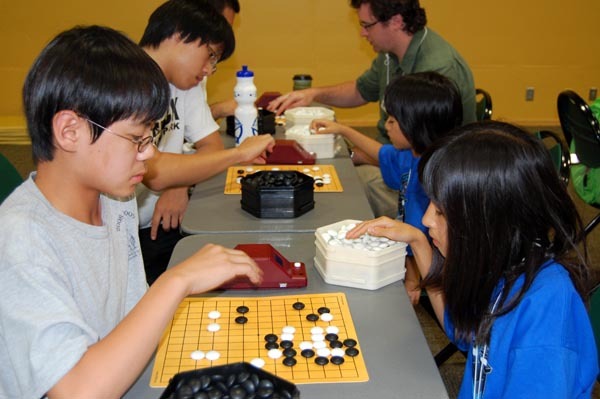 TANG WINS FIRST ROUND IN REDMOND CUP: Curtis Tang 7d won his first round Redmond Cup game against Jianing Gan this afternoon. Tang, the only player to defeat Gan in the qualifiers, had arrived at Congress at 3a Sunday morning, and played in the US Open a few hours later. Visibly tired, he rallied during the Redmond game to take the first match, which was broadcast live on KGS and drew hundreds of spectators. Tune in for round 2 at 3p Monday in the AGA Tournaments room on KGS. The Junior League game between 11-year-old 1-dans Henry Zhang and Oliver Wolf will also be broadcast at the same time.